Good news for St. Valentine’s Shopping Fever for 2015! The online shopping outlook for St. Valentine’s Day this year looks quite promising, according to a survey conducted by Prosper Insights and Analytics for the National Retail Federation (NRF). Considering that the online shopping for Valentine’s will be blooming this year and that more retailers are making informed decisions to invest in technology, you practically have no excuse if your online store is not functioning properly. 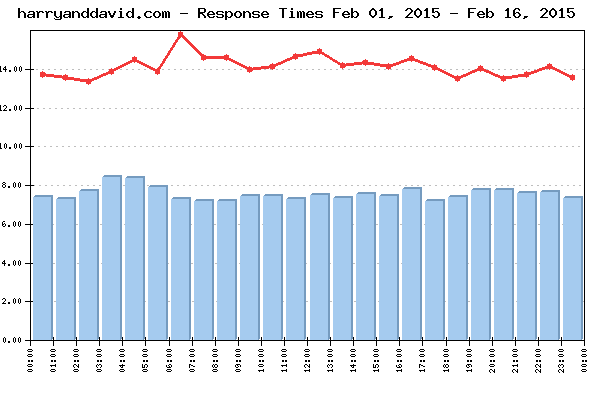 And, by “functioning properly” we mean the website’s response time and uptime are too high or too low respectively. Online shoppers come to your website to browse and purchase gifts for their beloved ones. This means if your website is slow or down during these first few seconds of their visit, you will lose their trust in no time hence their money. It’s quite effortless for users to go to a competitor whose website is working flawlessly and they can make that gift purchase immediately and hassle-free. Since we’ve been providing monitoring services enabling clients to increase the efficiency of their online transactions and decrease the loss of revenue for 15 years already, we find websites’ performance crusial, especially during heavy traffic flow. Therefore, we decided to monitor 7 of the most popular websites for gift purchasing during the Valentine’s fever – from January 31st until February 16th, 2015. We will be neatly reporting the details on their performance and availability on a daily basis throughout the whole period, just to see if they have foreseen possible traffic overflow. 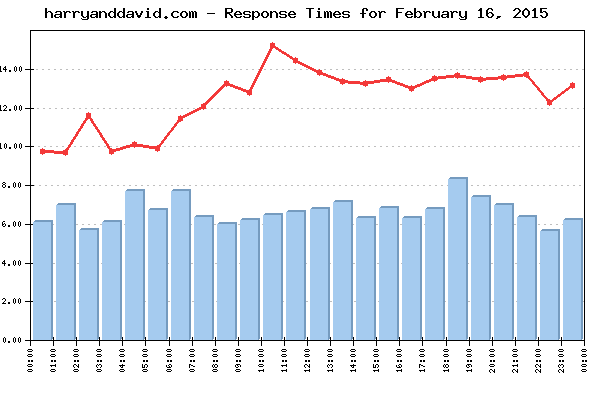 The daily Average Response time from all monitored websites was 12.519 sec. The Average Response time as measured from the US East Coast (Washington DC) was: 10.972 sec. The Average Response time as measured from the US West Coast (San Francisco, CA) was: 16.463 sec. 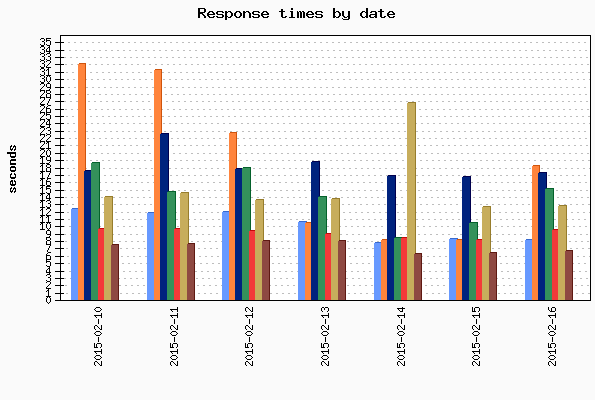 The Average Response time as measured from the US Central was (Chicago, IL): 10.121 sec. The Best Response time measured from US East Coast (Washington DC): 6.556 sec. The Best Response time measured from US West Coast (San Francisco, CA): 7.424 sec. The Best Response time measured from US Central was (Chicago, IL): 5.666 sec. The typical shopping transaction took the least time for harryanddavid.com visitors - 6.641 sec., while the visitors of ftd.com had to be the most patient, as the shopping transaction there took in average of 18.250 sec. The daily average uptime for the entire Group was 99.88%. Five websites were available with no interruptions - 100%. Six websites' availability was above the average, while one site dragged the average down with below-the-average availability. No events of particular importance or possible negative impact on the online visitors' interaction with the Websites included into the 2015 Valentine's day report were detected during the reported period, and according to WebSitePulse, the Group delivered the expected levels of End-User experience and Customer satisfaction. The 2015 Valentine's Day Reports reflect a complete fullpage web transaction, representative for the End Users' interactions with a website. The reporting period covers the dates between January 02 and February 16, 2015. Performance and availability measurements are made for a typical multi-step web transaction at 15 minute monitoring interval, every day 24/7. The WebSitePulse application monitoring service is used to collect data and to create the reports.